Microwaves are truly an awesome appliance. You could call them the epitome of the bachelor gadget, since so many unmarried men seem to rely on the device for all of their meals. 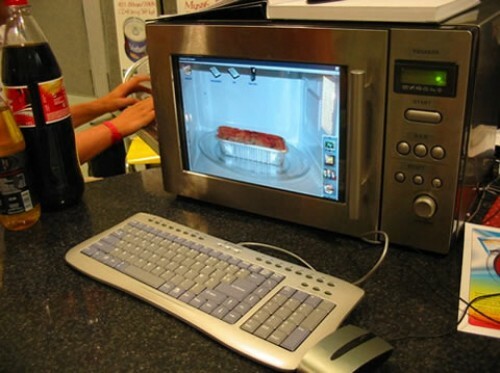 We can’t say we’ve ever thought of using a microwave like this. This excellent PC case mod makes your computer look like a stock-model microwave, complete with a cheap LED layout and a horizontally opening door. The window on the microwave has been ingeniously modded to act as the computer’s display, not to mention the microwave-themed desktop wallpaper. Do you remember playing with a toy called the Weeble? They were miniature weighted ovals, which sort of resembled very colorful paperweights. They were a perfect example of mindless fun and totally addictive. No matter how much you tried to wobble the little guys, they would never fall over. Seemingly inspired from the retro toy, the USB Tumbler Speaker from Brando refuses to fall, no matter how many times you attempt to shove it on its side. Thankfully, the novelty of owning a non-tumbling speaker doesn’t sacrifice the audio quality. Sanyo has introduced a couple of super-bright projectors to the masses – the PLC-XC55 and PLC-XC50. Both are extremely portable and small enough for mounting on the ceiling or placement on stationary desktops, making it perfect for personal use or even in classrooms. Each of these projectors also boast an extra security feature in the form of the durable Security Bar and a PIN number which is required in order to unlock the projector before it can be used. Sounds like the perfect candidates for the education sector where ease-of-use, portability and security are of the utmost importance. Interestingly enough, the PLC-XC55 and PLC-XC50 are equipped with Sanyo’s Active Maintenance Filter (AMF) that makes filter changing a snap. Those grocery lists. We have to write them every week. Milk, eggs, butter, yada yada yada. But what if you could just speak into a mic and have something print out for you? That way you can make your list while on the fly without having the fridge open or sticking your head into the pantry and then writing stuff down. I hate writing stuff down! But with the Electronic SmartShopper Grocery List Maker, you have one less list to write. It really couldn’t be easier. 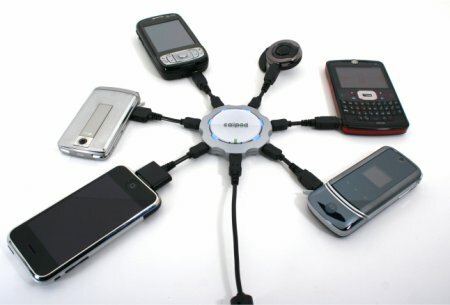 Remember the Chargepod that we covered slightly more than one year ago? Well, the device is still great to use and makes for the perfect traveling companion if you’re one who has plenty of gizmos to charge on your travels, but Callpod has decided to make it even more affordable by introducing a price cut. The Chargepod will now retail for a mere $39.95 while the bundle pack is going for $79.95 – a pretty good bargain considering how low the dollar stacks up against other currencies these days with no signs of stopping its downward spiral. To know more about the Chargepod, read on after the jump. Iomega’s eGo desktop hard drive has come in stylish variations in the past, but somehow storage space has always been limited until today. The leader in data protection and security has finally rolled out a 1TB version of its eGo desktop hard drive, dubbing it the “Super eGo“. Just how much more bloated do you think it will get in the future, and will other names feature even more astounding superlatives such as “Extreme eGo” or “Ultra eGo”? I’ll leave that to your imagination, but for now we’ll have to be content with the Super eGo being available in ruby red, midnight blue and jet black colors. It too, will take after a similar design as found on the hugely popular eGo portable hard drive, one of Iomega’s best sellers to date. To know more about the Super eGo, read on after the jump. If you’re a true handyman, you most likely have no room for novelty tools in your prized collection of ratchets and drivers. But aside from the real living-breathing handymen, you know there is someone out there who collects tools just so they can look like they’re proficient with a hammer. 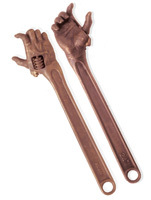 The Hand Wrench probably won’t be making its way into any construction worker’s tool set, but for the wannabe crafter who knows what it takes to look cool, it could be a hell of an addition. Or at least a great way to creep out the neighborhood, leaving you socially lonesome.